Q: What is the name of the lanky dog? Moonlight for Two is a Merrie Melodies cartoon from Hugh Harmon-Rudolf Ising Productions in association with Leon Schlesinger and distributed by Warner Bros. 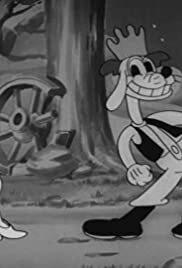 In this one, a hillbilly dog couple come to a dance while singing the title song. Many hilarious gags involving hillbilly stereotypes like the one of the sock still dancing while the musician takes it off his foot! My favorite ones involve a dancing stove who later saves the hero's life when a shotgun-shootin' bear disrupts the dance. Loved the hero using the stove to shoot the bear back! Highly amusing and well worth seeing for any animation fan of early Warner Bros. So long, folks!